New year goals have had a bad rap for a long time. It’s the natural time for a fresh start. We have goals for health, wealth and relationships. However, each year 1/3 of American’s make a goal but that goal is dismissed in 6 months. It’s not only the goal that’s important. It’s how to keep on track all year long with it. Here’s how to set up successful new year goals. Stephen Covey, productivity guru, writes all about how to be your personal best. Habit #2 of Covey’s Seven Habits of Highly Effective People is to “start with the end in mind.” When setting a goal, to “begin with the end in mind” helps us chart a course for success. When we define the goal, we have a clarity. What does the end look like? What does the end feel like? It’s a reminder of a road map analogy where you can’t travel to your destination without a road map. Making sure your goal is well defined to get to the end. Metrics are an important of defining your goal. How do you know you reached your goal? By setting up simple measure-able steps. It’s part of the SMART goals acronym: Specific, Measureable, Achieveable, Realistic and Time based. Be as specific as possible, with a measureable, realistic, achieveable time based goal. In addition, write down your SMART goals to see these each day. Make yourself accountable every day. Keep a money log of where you spent every dime and a food journal for every bite. Share your successes each day with supporters who help you stay on track. It’s keeping your eye on the prize every day that helps you measure your success. There are lots of pieces to reach your goal. You may not have all the skills to reach your goal. Working in collaboration makes reaching your goal more fun and easier to accomplish. The best practice is to seek out others who have a strength you need to reach your goal. At home and at work, your team helps you accomplish your goals. When you work as a team, the energy of your team makes the difference. Research shows that positive thinking helps you view more possibilities. With more possibilities, there’s greater probability for reaching your goals. Your goal may require more education, more organization, or more practice. You may already be aware of obstacles to your goal that can be avoided by learning more, taking a new track, or being more skilled. In all these cases sharpening up your skills gets you to your goal. Take a class to learn something new this year to make you more productive. Your business can expand as you read a blog, view a TEDx talk, or participate in a Mastermind group. And besides, you are probably someone who loves to learn so feed that part of your soul! Typically our new year goals are lose weight, get organized, or save money. Choose a goal that has compelling reason with a great end in mind. If it’s lose weight, what realistic number of pounds by what date do you want to lose?Who else is on your team who also wants to lose weight? What combination of tools will you use? What skills can you sharpen to help you? To be more organized, decide what space, what it will look like, and how many hours a week you will work toward the goal. Who can be your clutter buddy? What strategy will you use to declutter? To save money, use a tracking tool to see where you spend money now, review what can be cut down, and create a place where will the savings be held. How much do you want to save? Reaching your new year goals doesn’t have to be complicated, but it does have to be strategic. While having a goal is important, what’s more important is to have a compelling reason to accomplish your goal. Losing weight is really about living life more fully. Being more organized is really about being less stressed and sharing experiences. You save money to be more secure in our chaotic world. Find your compelling reason for your goal and it will make it much easier to stay committed. More tips and tricks for productivity, organizing and related ideas here! We can spend our days not following our dream or our path. Move forward in your personal direction by having a plan for your day. 1. Start the day with meditation, exercise or spiritual pursuits. It will start you on the path you want for the day. 2. At the end of each day write down your 3 most important tasks for the next day. You will start the day knowing and being productive. 3. Let go of activities that have become meaningless or lost value. Not really into knitting but now love cross stitch? No longer biking or lifting weights at home? Not loving the volunteering you used to love? Share them with other who love that activity. 4. Create a routine then ensures connection to others. Have a weekly Sunday supper with your family. Call your Mom and Dad every Tuesday when you drive home from work. Go to the waterpark with your grandkids every Friday afternoon. 5. Practice an attitude of gratitude. Write a thank you note, text to say thanks, and start a phone conversation with a thank you. 6. Be fabulous. Keep only clothes, shoes and accessories that make you look and feel fabulous. Have nothing in your home or office that is you do not believe to be useful or beautiful. 7. Take good care of yourself. Eat and hydrate well. Nourish your insides with water, fresh fruits and veggies. Get a great night’s rest. 8. Take extra care to be kind to yourself. When a bump in the road happens, graciously accept it as a small stop rather than the end itself. 9. Pace yourself. Build in transition times during the week, between activities and meetings and between the week and weekend. 10. Surround yourself with positivity. Nurture and support others and accept the same in return. It’s truly about not only creating a life you envision, but acting on your plan too. 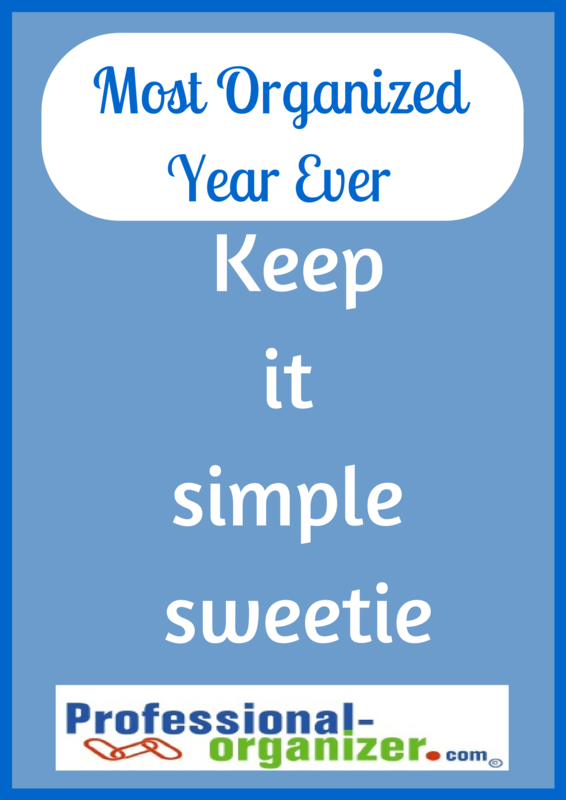 My own personal mantra has always been “Keep it simple sweetie.” No matter the situation or the conversation, my life resolves around keeping it simple. What happens when it’s not simple? Stress! It’s that simple. Ruthlessly look for ways to cut down on clutter. Break away from complicated commitments that drag you down and have no meaning. Keep decision making to three choices. Simplify by letting go of MORE than you think you can. Set limits on how much comes into your office or home. Look for ways to streamline your life. Streamline all processes at home and work. Set aside time for organizing, prioritizing, processing and planning. This is the last post of our 31 day series. Let me know what has been most valuable. 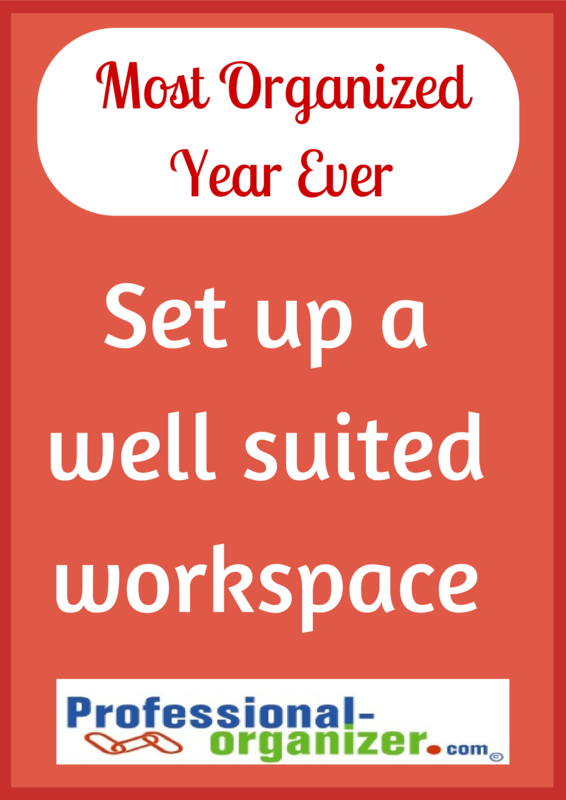 Keep your organizing and productivity all year! Join my newsletter. Your task list is a mile long! You know you won’t get it all done, but you have magical thinking that it will be all done. What’s the best way to feel accomplished? Prioritize your top three tasks for the day. Your three tasks may be the most urgent due to the deadline. Your three tasks might be the ones that bring in revenue. Your three tasks might be established by your boss. Write your three tasks out the night before so you are ready to work the next day. The only task you can be sure of each day is the first one you start that day. Get started with your tasks before you review email so you can use crucial thinking time when you are at your best. Start with a timer if you need to jump in right away. Work for an uninterrupted hour and see how much you accomplish. 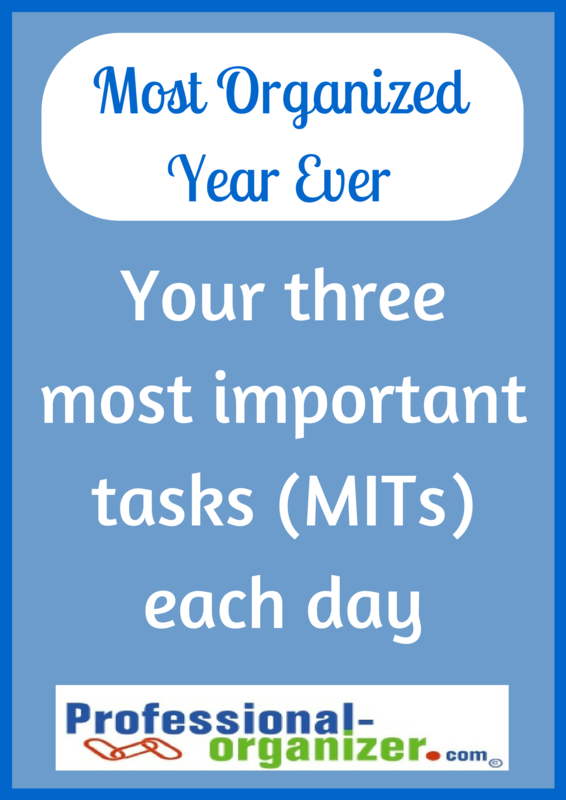 Make this Your Most Organized Year Ever with prioritizing your 3 most important tasks (MITs). Join my newsletter for a boost of productivity! Getting a good night’s sleep is critical to everyone, including parents, singletons, grandparents, and kids. This is especially true in the ADHD home. Why are we bedtime procrastinators? Get ready for bed way ahead. 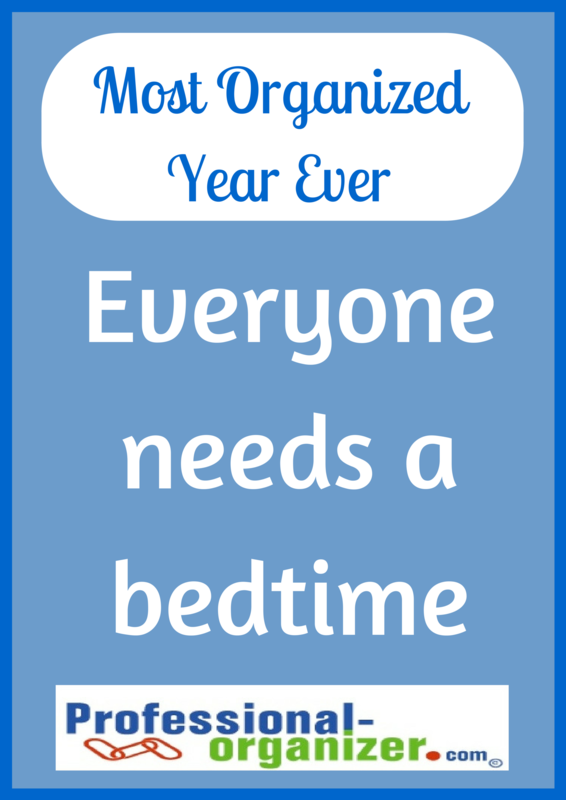 When you are in your jammies with your teeth brushed, you are more likely to get in bed at your designated bedtime. Set the mood for sleep in your bedroom. No paper clutter, your clothes folded, your room cool and your room dark. You can set up a great space for sleeping this way. Calculate your bedtime for 8 hours of sleep. Get in bed 30 minutes before. Have the same bedtime nightly. Eliminate blue light from e-readers, phones or other tech equipment with a central family charging space. Start early with baths and tuck in time to have a relaxing bedtime ritual. According to a National Sleep Foundation (NSF) survey, only 20% of adolescents get the recommended nine hours of sleep per night on school nights. The NSF recommends that children ages 3 to 5 need 11 to 13 hours; ages 5 to 10 need 10 to 11 hours; ages 10 to 17 need 8.5. to 9.5 hours; ages 18 and above need 7 to 9 hours. Sleep helps our productivity and efficiency. A productive day starts the night before. Make this Your Most Organized Year Ever with everyone having a good night’s rest. Check out my pinterest page for Family Manager. Rejuvenation time is time for you to relax and gain back energy. 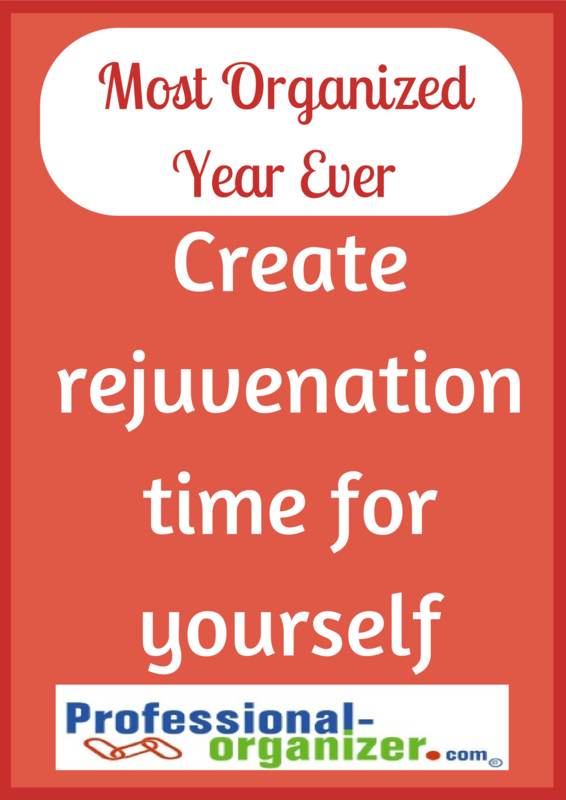 Do you give yourself time to rejuvenate? Research shows rejuvenation is important in order to regain focus, invigorate creativity and be more organized. It’s a way of taking care of ourself to do our best. Create rejuvenation time in your week. Set aside time each week to have unstructured time. Set aside time to play and be creative. Set aside time for meditation. Set aside time to be in green space. Set aside commitments that keep you from having rejuvenation time. Rejuvenation time won’t happen without your mindfulness. Your energy will soar as well as your positivity. Make this Your Most Organized Year Ever by inserting time for rejuvenation in your week. Boost your organizing and productivity skills with 31 tips to Your Most Organized Year Ever. Your productivity depends on setting up a well suited work space. For most of us, an uncluttered desk in a well lit office creates an efficient and effective work space. Keep only on your desk what you use each day. Create a command center for action papers. Set up easy to access files for references. Clear your desk daily to keep it efficient. If you work at home, your work space might be mobile. Set up a portable command center for papers. Include electronic cables and other essentials for mobility. Take time out during the day to eat, take a walk and be sociable. Make this Your Most Organized Year Ever with a well suited work space includes elements that make you happy and productive. Need a boost of organizing energy? Join my newsletter! It can be surprising how much alarms, timers and other reminders can help us during our day. We have so much to think about, these tools help us execute our intentions. 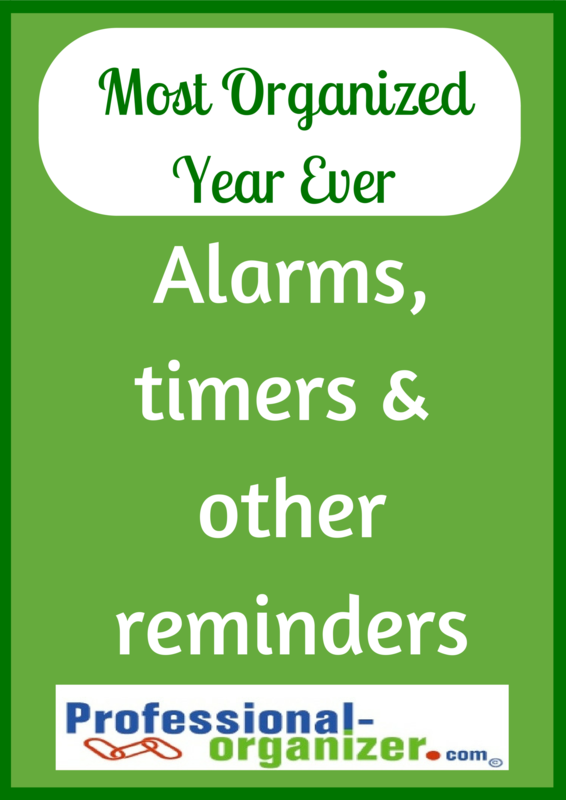 Make this Your Most Organized Year Ever with alarms, timers and other reminders. Notice where there are clocks in your home and office? Are these digital or analog clocks? Adding more clocks in your home and office will help manage your time more effectively. An analog clock helps you judge that time is passing. It’s a visual tool that helps us assess. It can also help remind us of what step in a process we want to be at in order to get to the finish line. Having a clock in a bathroom helps us get out the door on time. Having a wall clock hanging in your office helps you finish your work to be home on time. 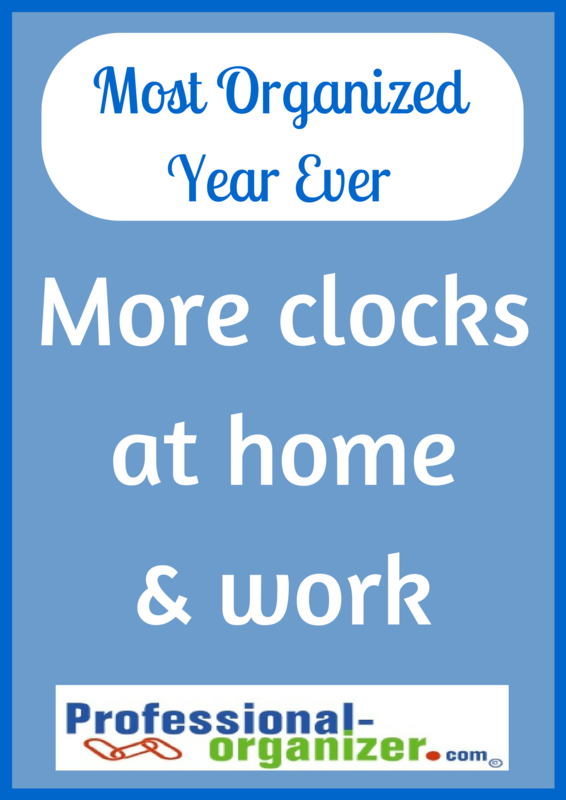 Make this Your Most Organized Year Ever by adding more analog clocks in your home and office. More ideas on time management on my Time is On My Side pinterest board.